Manchester City turned down the chance to sign their future manager Pep Guardiola as a player 11 years ago, according to Stuart Pearce. Ex-Barcelona midfielder Guardiola had a trial with City in the summer of 2005 but then-manager Pearce opted not to sign him. Guardiola, 45, will replace current City boss Manuel Pellegrini in June. "If I knew how good he would be as a manager I would have given him my job," Pearce told BBC Radio 5 live. 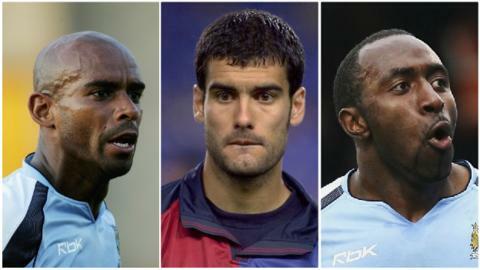 City, whose squad at the time featured the likes of David James, Trevor Sinclair, Joey Barton and Darius Vassell, finished the 2005-06 Premier League season in 15th place. "He trained with us for a few days," said Pearce. "He had been playing in the Middle East, and was looking for a contract. "Smashing fella but, back then, I didn't realise he would be a top manager. We didn't have anything on the playing side but top man, top manager, what an acquisition for City." Guardiola, who was 34 years old in 2005 and eyeing a return to European football after leaving Al-Ahli in Dubai, made more than 350 appearances for Barcelona between 1990 and 2001, winning the European Cup and six La Liga titles. He played under current Manchester United boss Louis van Gaal at the Nou Camp and before City announced Guardiola's impending arrival, there was speculation he could replace the Dutchman at Old Trafford. Van Gaal has welcomed his former player to the Premier League and, following United's 3-0 win over Stoke on Tuesday, sounded like a man planning to stick around long enough to face him. "He is my former captain so I am very pleased to see him and I can speak Spanish so it is convenient for him," Van Gaal said. Guardiola went on to play briefly for Mexican side Dorados before taking charge of Barcelona B and later Barcelona. He won 14 trophies in four years at the Nou Camp between 2008 and 2012. He has since won the Bundesliga twice in his first two seasons in charge of Bayern Munich. Toure & Silva out, Messi & Pogba in? Read more on Pep Guardiola at Man City: Toure & Silva out, Messi & Pogba in?